How many times did you feel pain in some part of your body, and just in a few seconds you find yourself online “googling” about your symptoms? You’re not the only one, not by far. One third of grown-ups seeks their diagnosis online. In my opinion, that number should be even bigger. Nonetheless, after plain ”googling” of your symptoms, more often than not, you end up being more confused and scared. This happens because of the way we search the internet, meaning that we often write queries by using slang words which the computer sometimes cannot understand. 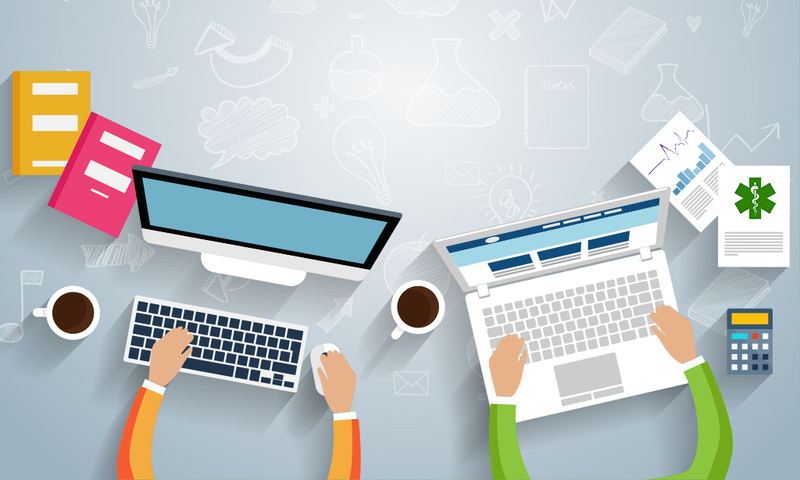 For that reason, many online tools (software) appeared in past few years, and they aim to tackle this issue. Their goal is to make health information and symptom search more reliable and accurate. All variatons of these software tools are simply named: symptom checkers. Why do we need symptom checkers? As I mentioned in the beginning of this post, the moment when you feel pain or you just feel unwell, is the precise moment when you need quick and reliable information. That way you can decide what you need to do next. Are you feeling ill due to fatigue? Is it a just a common cold? Or those symptoms point to something much more serious, something that needs urgent medical care? Or, in the worst case scenario, you should’ve already been on your way to hospital? Only by reading this, you probably felt anxiety and panic, and that’s the best depiction of how millions of people feel each day. This would be the place and time for symptom checkers to “do their thing”. They appeared in past few years, and many medical centers developed their own iteration, most notably Harvard Medical School and Mayo Clinic. Thanks to them, you can install the symptom checker application on your smartphone, and from the comfort of your bed check what your symptoms imply. Once the application gathers enough info about your symptoms from the answers you provided, it will use its advanced algorithm and knowledge database to offer you the most probable diagnosis. 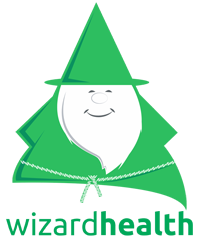 You can see them as your first aid, because it will also advise you on whether you should see a doctor urgently or in a few days, or maybe you just need to rest a bit. For now, all of this sounds so perfect. But, we have to ask ourselves how accurate these software tools really are? Before we jump to the conclusion on whether these tools are reliable, we’ll look into the most recent studies which evaluated the success rate of symptom checkers. The first comprehensive study was conducted on Harvard Medical School and it was published in the BMJ medical journal. This study wasn’t aimed to directly compare symptom checkers to doctors, but to test the accuracy of symptom checkers. The research was done by using 23 most relevant symptom checkers available on the internet at that time (back in 2014). To evaluate the symptom checkers, the researchers used 45 standardized patient vignettes that included serious and trivial conditions. Just few weeks ago, another study was published. This time around, they tested symptom checkers accuracy in comparison to doctors. Science circles described it as the first clash of “Man vs Machine”. The researchers now gave the same vignettes from the 2014. study to doctors without them knowing that those vignettes were a part of a research study. Doctors were more successful by providing the correct diagnosis in 72,1% of cases, while symptom checkers’ result was 34%. It’s worth mentioning that doctors provided the correct diagnosis among first three offered in 84,2% of cases. In comparison, symptom checkers managed to do the same in 51,2% of cases. As we can notice, doctors are still significantly better than symptom checkers in providing the correct diagnosis, but they still offer the incorrect diagnosis in 15% of cases. 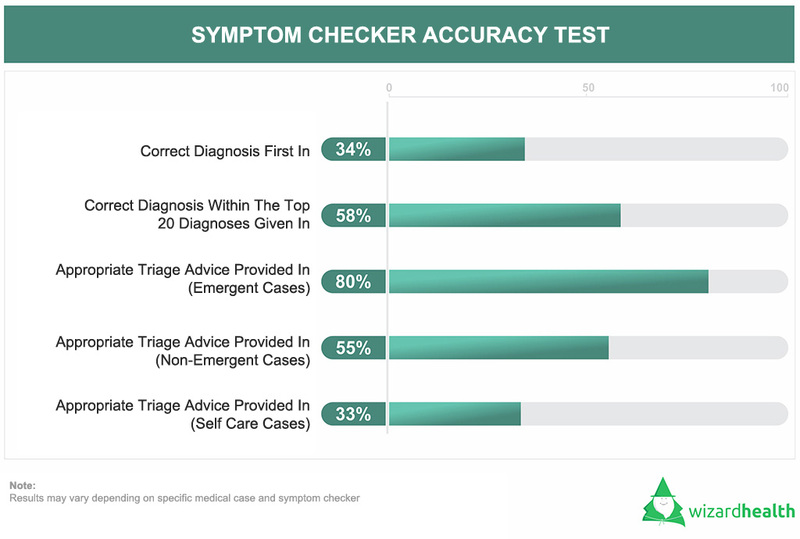 Dr. Mehrotra states that symptom checkers performed very well in triage of urgent medical cases by providing the accurate triage in 80% of cases. He added that it’s more important to know whether to seek emergency care, than to know your exact diagnosis. Symptom checkers appeared to be risk adverse, by encouraging users to seek care even when self care would be more reasonable. 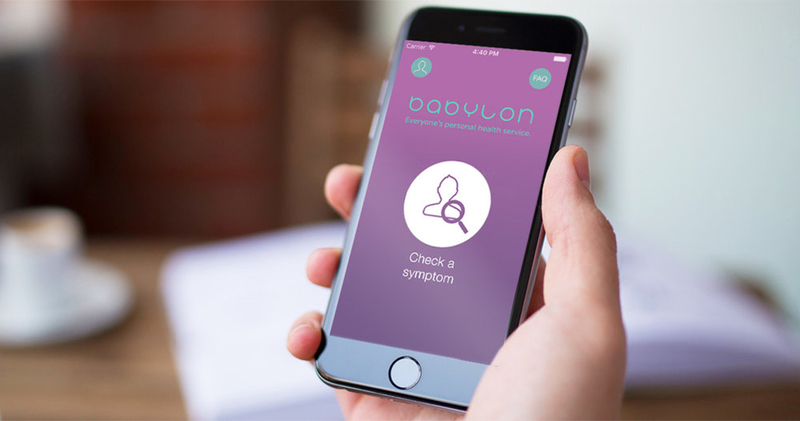 Babylon symptom checker is a product of a UK based startup company “Babylon Health”, and it’s slowly but steadily becoming a leader in providing online health services. Mostly due to their vision and currently the most advanced symptom checker. Along with their symptom checker, they offer a monthly subscription to their services which include a direct video/audio call with their doctors, as well as an option to visit “Babylon Health” doctors in person. But it’s the Babylon symptom checker that makes the difference, because it uses the most advanced artificial intelligence and rich knowledge base. Knowledge base is updated thanks to a partnership with three large hospitals in the UK. Their algorithm will “learn” from a relevant and huge database of around 1.6 million patient medical records. In June this year, Babylon Health performed an in house “live challenge” between their AI, senior nurse, and an Oxford-educated junior doctor. The results were compared and validated by a UCL professor dr. Irwin Nazareth. We can notice that Babylon symptom checker was faster and more accurate in providing the appropriate medical triage (92%) than “humans”. These are quite impressive results for a “computer” if we have in mind that it has been in a “learning” process for only a couple of years. In comparison, our junior doctor had a minimum 7 years of education and the medical nurse has a few decades of day to day experience in medicine. Just to make things clear, we all have one common goal. Current healthcare system, even in developed countries, isn’t something to write home about it. It’s a system where every fifth patient can’t see a doctor when he needs to, a system where one in eight of us gets misdiagnosed, while thousands of us die each month because of avoidable mistakes. And we should be content with a system like this? We shouldn’t, we can’t afford it! This is why we have to seek new ways to improve our healthcare. Symptom checkers are certainly one of them, and they can play a significant role. Firstly, they can provide patients easy access to diagnosis and triage, and by doing that they strongly encourage patients to think about their health in a more preventive way. And the other role is to put the “machine” in a place where it helps doctors with diagnosis and triage. Complementing each other like this, by combining the speed and memory of the “machine” with the instinct and compassionate approach of the doctors, we may dream about some “super doctors” among us in the future. Still, after all we said in this post, we can conclude that the “machine” still cannot replace our doctors, but we’re sure they can be a big help to them.